At The Place for Kitchens and Baths, we combine this expertise with ingenuity and creative thinking to turn your average space into an extraordinary one, reflecting your tastes and personality. 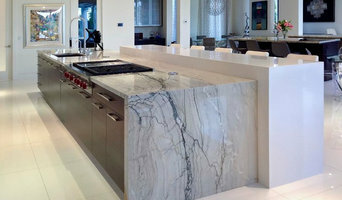 Boca Kitchens & Floors offers an approximate 7,000 sq. 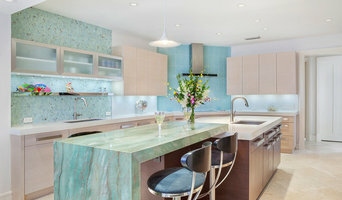 ft. showroom of kitchen, bath and flooring ideas and has some of the most talented and experienced design professionals. Concept Kitchen & Bath has blended the talents and skills of craftsmen to provide beautiful cabinets, used by some of the most discriminating home builders and homeowners alike. TREND Transformations® brings affordable luxury to life. Whether it’s your kitchen, your bathroom, or your commercial space, we have everything you need to design your ultimate dream space. Are you looking for a qualified and affordable bathroom remodeling expert that can do full or partial bathroom renovations? Then you found the right company for all your bathroom renovation needs. I specialize in the complete Interior Design and Remodeling of your home. My showroom has everything you need to complete your project simplifying your life from start to finish. "Try before you buy" at Tubs & More. Feel free to test drive one of our whirlpool tubs. We are the only place in South Florida with a live working showroom full of working tubs. Nance’s diverse talents, dedication to her clients, and emphasis on detail enable her to create a wide range of designs to meet a variety of styles. Whether building a new home, turning a room into a home office, or simply remodeling a kitchen or bath. Nance will enthusiastically tackle any size project. She has assembled an exceptional team of installers for cabinets, countertops, wood floors, tile and marble, window treatments, and moldings; not to mention an expert General Contractor should your project require one.I specialize in the complete Interior Design and Remodeling of your home. My showroom has everything you need to complete your project simplifying your life from start to finish. Coast to Coast Marble and Tile Group, an establish company that specializes in Marble, Granite & Tile for Flooring and complete Bathroom remodeling. We are family owned and operated. We are insured. We specialize in kitchen & bathroom remodeling. At Kitchen & Bath Galleria; we provide affordable kitchens & bath solutions. We provide kitchen, bath remodeling and designs. We can create and implement the perfect design to achieve your desires. We pride ourselves in representing and selling top quality kitchen cabinets from the leading manufacturers. We have just the right cabinetry selection to meet a variety of tastes and preferences. 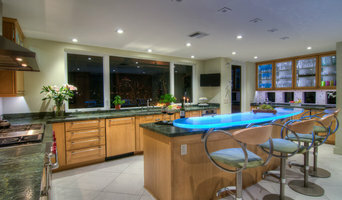 Broward County's Top Kitchen/Bath Remodeler- 4X Best of Houzz Winner! We are dedicated to getting your job done from start to finish in a timely manner. Listening to our clients' needs and paying close attention to detail is of utmost importance. Are you looking for a qualified AND affordable Kitchen & Bathroom remodeling expert that can do full or partial Kitchen & Bathroom renovations? Then you found the right company for all your Kitchen & Bathroom renovation needs. Once I retired from playing Football, Hurricane Andrew came thru Homestead (August 1992) and there I was helping rebuild one home at a time. During the housing market crash, my wife and I started buying abandoned homes and started "Flipping" them. 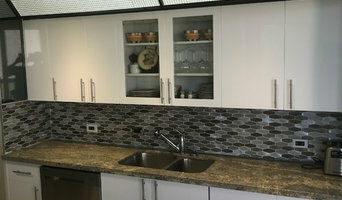 After "Flipping" hundreds of houses we decided to offer our Kitchen & Bathroom Remodeling services to the general public. We offer Pre-assembled and Custom Kitchens, Custom Fit Showers, Walk In Tubs, Bath Liners and Wall systems, and a large selection of Shower Doors and Fixtures, we have the widest selection of Kitchen & Bathroom products in the Tri-County Area. At A To Z Kitchen & Bathroom Factory, we recognize the importance of a great installation. Even the best quality products don’t last if they’re not installed properly. That’s why we only hire skilled, experienced tradespeople. Best of all most projects can be completed in as little as one day! From pillar to post, we provide a full design and remodeling service. We are very hands-on while working with our client to achieve a design beyond their expectations. Majestic Kitchens and Baths was established in 2009 by Carlos Lema. Headquartered in Margate Florida, we are a family business and are proud to say that a large percentage of our business comes from referrals of our clients. Our main goal is to give our clients the outmost satisfaction while providing functional and elegant solutions for their homes. Here at MKB we offer FREE in home estimates to all clients and make sure to bring your visions to life by using the latest 20|20 technology program. We will work with you through an easy going, step by step process to making sure your dream kitchen becomes a reality within your budget. Donco Designs is a licensed, insured & trusted residential remodeling contractor & renovation specialist. We know how to complete a project on-time and within budget. Re-Bath is your local bathroom remodeling specialist. At Re-Bath, we believe that bathroom remodeling doesn't need to be a messy, expensive headache. Our professional installation process makes remodeling your bathroom easy, convenient and affordable. Our factory-trained installers deliver professional and courteous service every step of the way. A beautiful, new bathroom doesn’t have to mean weeks of workers, debris and expense. Over 30 years ago, Re-Bath reinvented bathroom remodeling with a quick and convenient solution. Since then, we’ve renovated millions of bathrooms with our high quality DuraBath SSP™ material cleanly, quickly and affordably without interrupting life at home. And it often takes just a few days to complete your customized bathroom. Re-Bath presents you with an alternative to worn out bathtubs, outdated tile walls and dingy shower bases. We offer a range of replacement bathtubs, walk-in bathtubs, bathtub to shower conversions and much more. We’re sure you’ll find it’s easier to enjoy a long soak or refreshing shower when you’re surrounded by a freshly renovated bathtub or shower. With lifetime warranty on most of our products. So Relax, Refresh, Renew and call Re-Bath today for a Free In-Home Estimate! At Kitchen & Bath Galleria; our primary focus is custom cabinetry solutions for all the rooms of your home. We work to guide you through the latest products and trends, making selections for your project. Creating and implementing the perfect design to achieve your desired result. While working, primarily, with American made and manufactured cabinetry companies. Our staff of dedicated professionals provides our customers the personal care and attention they deserve. From the initial planning sessions to the finishing touches, each project is approached with fresh enthusiasm. We appreciate the invitation into your home and recognize that you and your family will live with the results of our work. Please contact Julie Stoner, ASID, CKD personally at 610-283-2350. Thanks for choosing Florida's kitchen and bath design leader! 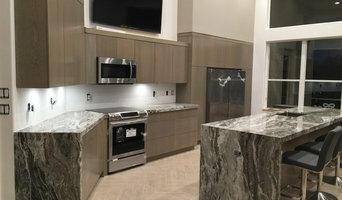 Owners Nora and Elliott Landman want to give their customers the best value when it comes to enhancing the beauty of their homes through the latest trends in kitchen design. Kitchens and bathrooms are two of the hardest-working spaces in any home. When it’s time to update them, ensure that they stay at peak functionality by hiring a Fort Lauderdale kitchen and bathroom remodeler. With an eye for aesthetics, a practical approach to layout and design, and the skills of a contractor, a bath or kitchen remodeler in Fort Lauderdale, FL can help you execute a remodel suited your personal style and needs. What does a Fort Lauderdale kitchen and bath remodeling expert do? Licensed Florida kitchen and bath remodelers are contractors who specialize in altering the structure of an existing space, rather than building one from the ground up. Because he or she must deal with a previous builder’s work, the job can get more complicated than new construction. You might wonder why they often specialize in both kitchens and bathrooms, but if you think about those two spaces, they actually have a lot in common. Kitchens and bathrooms include an abundance of fixtures that require careful planning and installation, including sinks, faucets, tubs and toilets that all need water hookups and drainage. They also use similar materials, such as tile and stone for countertops and flooring, due to the nature of their use. So it makes sense that Fort Lauderdale kitchen remodelers and bathroom remodelers be one in the same. A bathroom or kitchen remodeler translates architectural plans from page to reality; some are also trained to provide design services so that you don’t have to hire a separate pro. Like a general contractor, a kitchen and bathroom remodeler in Fort Lauderdale, FL is responsible for hiring and supervising subcontractors and providing materials when necessary. They also should have a thorough knowledge of Florida building codes and construction-related legal issues, as well as current design and product trends. Here are some related professionals and vendors to complement the work of kitchen & bath remodelers: Woodworkers & Carpenters, Kitchen & Bath Designers, Interior Designers & Decorators, Architects & Building Designers, General Contractors. Find a Fort Lauderdale kitchen and bathroom renovator on Houzz. Narrow your search in the Professionals section of the website to kitchen and bathroom remodelers in Fort Lauderdale, FL. You may also look through photos of Fort Lauderdale, FL spaces to find kitchens or bathrooms you like, then contact the bathroom or kitchen remodeler who worked on it.